CoinOpCollectorForum.com • View topic - 5 Jacks or Reproduction? I have acquired a 5 Jacks machine from my grandfather and think it may be a reproduction. I can't find much information on this machine, so I decided to try here. Re: 5 Jacks or Reproduction? Turn it around open it up show us the guts and both sides of the lock. That may get good input for you. Thanks Richard. Here are a few of the lock and inside. Your "Five Jacks" machine, is definitely one of the many total reproductions that have been made for several years. paper that is taped inside the door, which shows the "3 Jacks" machine, which is also reproduced by the same person. Well , it must be worth something , & no doubt fun to play. get it up & working, & no worries over the young ones playing it also. Thank you for verifying! Any idea on value? I see one online that went for just under $200. It has been in the family since at least the 80's so I am certain my grandfather "rigged" up the machine! That's his tape! The kids really do love to play. Does anyone have a photo of the missing parts inside? i reckon its worth the $200 you have stated. i know its a repro, but don't let that make you sad, I think you had your own doubts anyhow!! I hope it has not put you off finding out more about these wonderful mechanical devices. 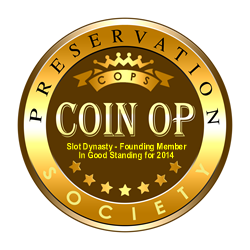 There are plenty of Original coin drop Stimulators for reasonable money out there, why not add anotherto stand alongside your Jacks? Maybe you would like to own more than one, they look great displayed together. 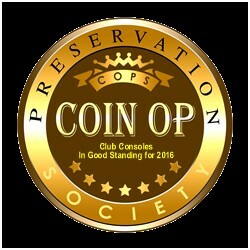 if you get an original coin drop it will be obvious the difference with the one you have. Dave: Royal Bell only made Repro "3 Jacks" in 10c play, as shown on the paper taped inside the door on this one. They did them in 10c, so that you would know their repro from an original, and also advertised they were repro. someone removed the plate, to try and pass it off as original, you would usually still see the 4 small holes. No originals were ever 10c play. All were either 1c or 5c. 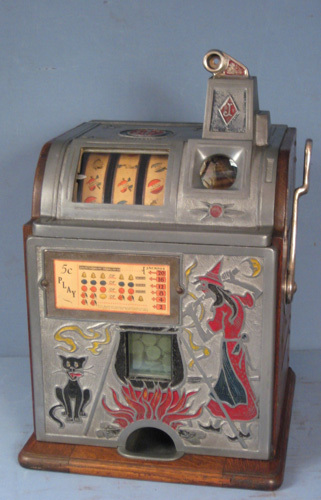 Royal Bell never made any repro "Five Jacks" machines. Thank you for all of the information. It looks like a reproduction. My 7 year old niece played this machine for hours today. The pennies kept getting stuck in various positions, but she would remove the back and remove the jam. My question is how reliable are these reproductions when restored? It seemed if there are too many pennies in the 5 supply pots eventually it would clog up. Or when she turned the side crank too quickly and didn't release all of the pennies. Either way she was all smiles. Anyone need a 5 Jacks Reproduction in their collection? I'm more into 80's pinball or Chexx tables.